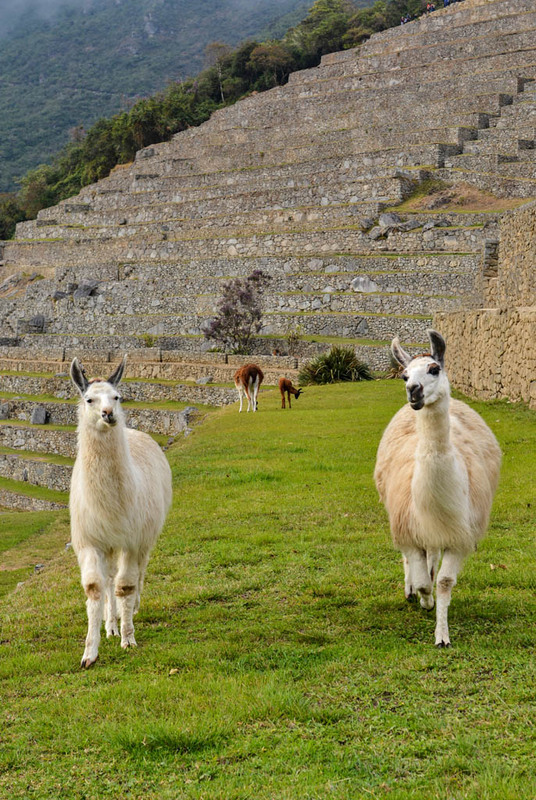 Explore the quaint cobblestone streets of Cusco with colourful locals and their adorable llamas and the ancient mystical Machu Picchu. 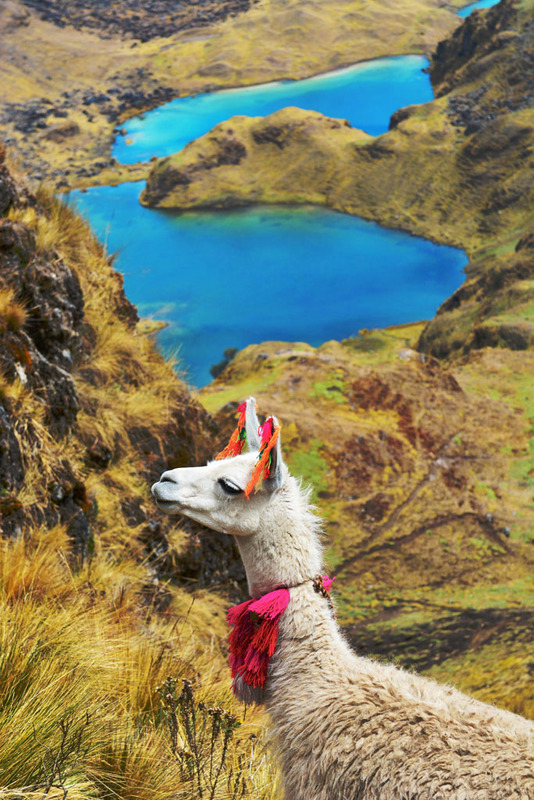 Discover snowy mountain peaks and turquoise lakes of the Andes. Encounter authentic villages that still practice the Inca lifestyle and cute furry characters of the Amazon. Peru is waiting to dazzle you. Peru only has two distinct seasons, dry and wet. This is because it’s on the equator. High Season coincides with the driest months of May to October with the busiest times during July and August which is winter. Winter in the Andes is beautiful; the days are sunny at about 20°C and the nights chilly sometimes dropping as low as 1°C. In the highlands, temperatures can drop as low as -5°C. The above doesn’t apply to the jungle. Average temperature all year is about 31°C max and 21°C min. Late September to October is a great time to visit Peru if you want to avoid the crowds. The weather is still beautiful but there is a chance of light showers. There is also less snow in the mountains. November to April is the wet season. In the mountains, the roads and treks can be impassable during the wettest times. This is also the quiet time when visitors are almost guaranteed of having places to themselves. The winter scenery in the Andes is spectacular. Yellow Fever Vaccination is essential for Peru. When arriving back in Australia and most other countries, officials ask to see proof of it. When arriving in Cusco (3400 metres elevation), drink plenty of fluids especially after long flights. Dehydration makes it harder to cope with the high altitude. Try to avoid alcohol especially the first 24 hours and avoid it altogether before a trek. Drink lots of water, juices and coca tea. A lot of people have told us the herb Gingko Biloba helps them with the altitude. Medications such as Dexamethasone can reduce the effects but no medication can prevent altitude sickness. There are no shortages of ATMS and money changes in Peru especially in the bigger cities such as Lima, Cusco and Iquitos. Many ATMs are secure with the big banks where customers go inside to use them. Most give the option of withdrawing in Soles or US Dollars. In Aguas Calientes, Ollantaytambo and smaller towns they are harder to find. It is always a good idea to have cash on you before travelling to these places. The markets in the Sacred Valley are at their best and busiest on Sundays. Pisac market still has plenty of stalls and a lot to see any day of the week, though. Chinchero market is a lot smaller on weekdays and specialises in weaving and textiles. Locals are usually happy to have their photos taken when asked. Be prepared to pay a couple of Soles. It is handy to always have some small change. 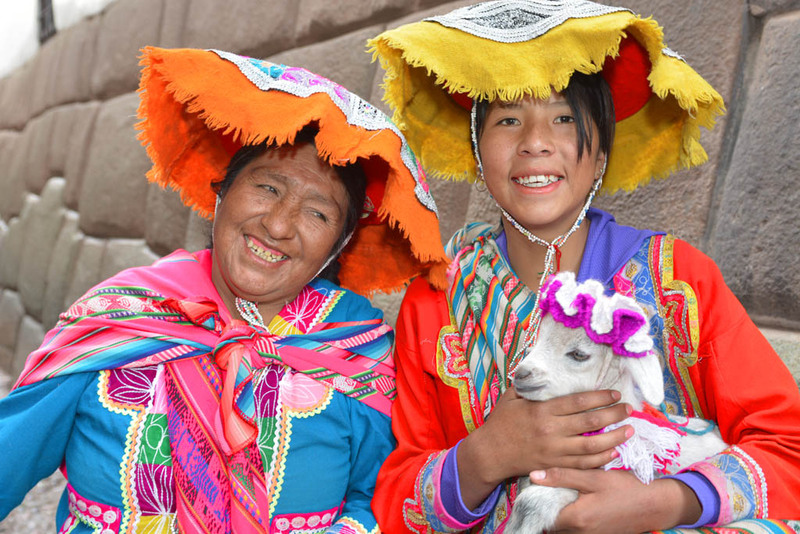 Many locals, using their innovation dress in traditional clothing and accompanied by their llamas make a living from this. Most hotels have free WiFi. The Peru power supply is 220 Volt 60Hz and Type A / B / C Plug. The only exception is Arequipa which has 220 Volt 50Hz. Though Peruvian dishes are mainly meat-based, vegetarian is usually available in Peru. If no specialised vegetarian is available there are many pizzerias and most have vegetarian pizza options or will make a custom pizza or adapt food on the menu for vegetarians.We love the food in Cusco and Ollantaytambo, as there are so many vegetarian choices. Our favourites in Cusco are a local pizzeria called La Bodega, Jack’s Café and Green Point My Vegan Restaurant (not to be confused with Green’s Organic). 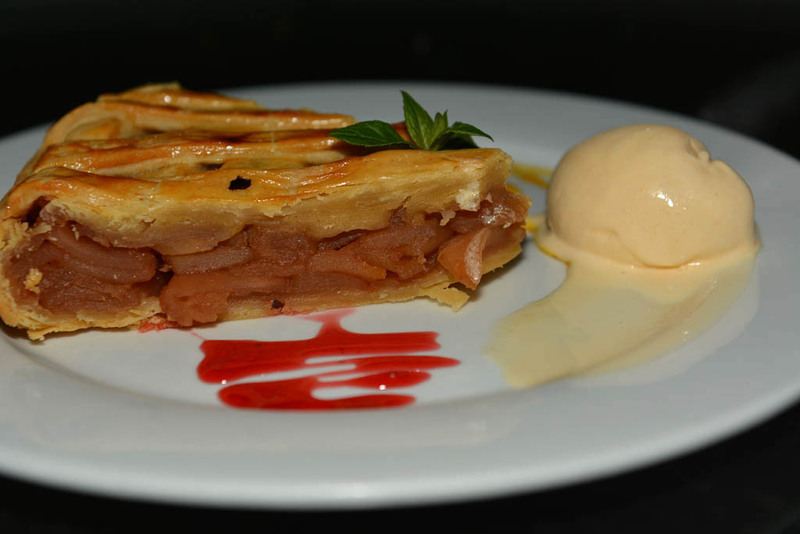 In Ollantaytambo, El Albergue serves some of the best vegetarian food. In Aguas Calientes, The Tree House, Incontri del pueblo Viejo and El Indio. These are not specialised vegetarian restaurants, but they are really nice. 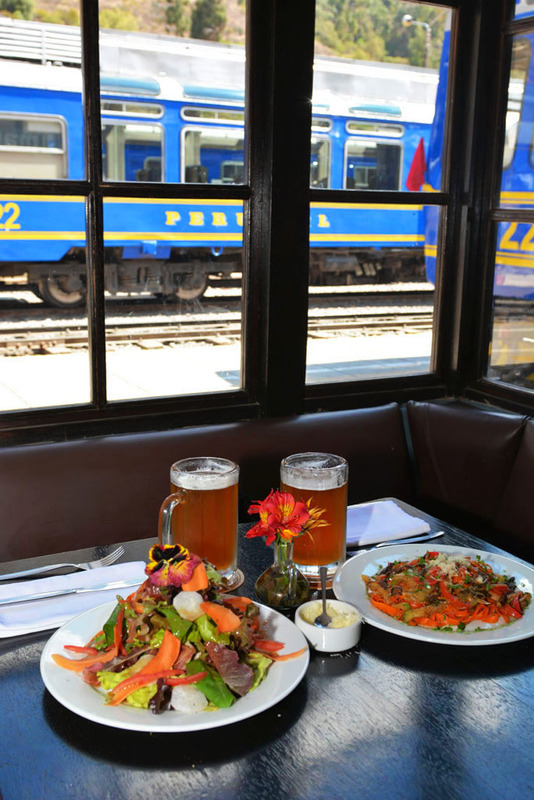 In Cusco and Ollantaytambo, there are many quaint local restaurants overlooking the main square and most of these have vegetarian options on their menus. 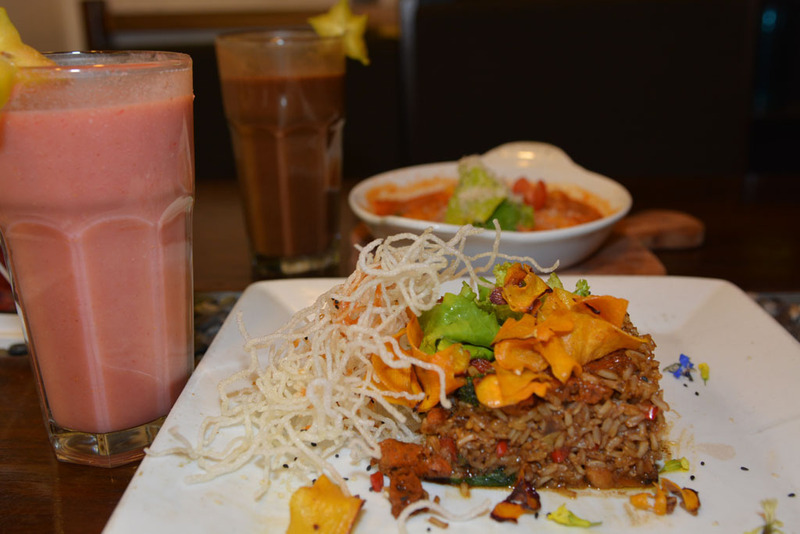 Our favourite cafe in Iquitos is Karma Café which has lots of delicious vegetarian and healthy options. The breakfasts supplied at most of the hotels consist of tea, coffee, fruit juices, eggs to order, toast, pancakes and fruit. Train tickets to Machu Picchu can be sold out weeks in advance during the high season. Trains trips from Ollantaytambo to Machu Picchu take about 90 minutes to 2 hours. Trains also depart from Poroy; a small village about 20 minutes out of Cusco. It takes about 3 hours and 30 minutes to get to Machu Picchu. This route often has track closures because of the terrain. Taking a bus, taxi or private transport to Ollantaytambo first is the easiest and less expensive way to get to Machu Picchu. 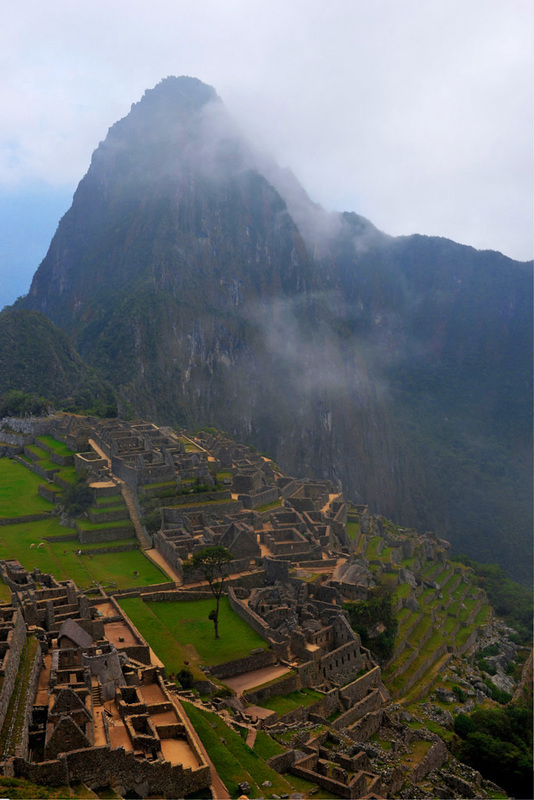 Purchase entrance tickets to Machu Picchu before you leave Aguas Calientes. At Machu Picchu, payment options are limited and there can be delays at the gate. During the high season, to be among the first visitors at Machu Picchu visitors need to be at the bus stop in Aguas Calientes no later than 4 am. Though the site doesn’t open until 6 am the crowds start lining up at the bus stop way before this. Hotels in Aguas Calientes will pack a breakfast that guests can take with them. There are also cafes near the bus stop that open early for commuters. From Aguas Calientes to Machu Picchu the bus ride takes about half an hour. Visitors must take their passport, as this is necessary at the entrance. One of the best views of Machu Picchu is from the Guardhouse. Treks to Machu Picchu need to be booked up to 6 months in advance throughout the high season. There is a limit of 500 people a day on the trek. This makes it very busy and camps and toilets get crowded. Some travellers walk or run up to Machu Picchu from Aguas Calientes. It is a steep uphill climb that gains 400 metres altitude. (Machu Picchu is 2430 metres elevation.) The gates outside of Aguas Calientes open at 5.30 am so walkers can’t leave before this. We spoke to a couple who were into their fitness and it took them an hour to run up. The average person can expect to take about 2-3 hours walking. For that ultimate shot and panoramic views head straight to the ‘Guardhouse’. It is easy to find by following the map that’s handed out at the entrance. The Sun Gate is about another 45 minutes to an hour walk uphill. From here there is an impressive view of Machu Picchu and all the surroundings. As beautiful as it is, Machu Picchu is very much in the distance. The round trip is 2-4 hours, so when arriving back at the ruins, the crowds have arrived. The trek to Huayna Picchu takes about 2 -3 hours. It is very exposed, steep and a lot of stairs. This trek is challenging and not for everyone. The view of Machu Picchu is even further away here than the Sun Gate. Re-entry into Machu Picchu is allowed 3 times a day. This means visitors can leave late morning when it starts to get hot and crowded and return in the late afternoon when it’s cooler and fewer crowds. Bathrooms at Machu Picchu are outside the gates. Re-entry also includes visits to the bathroom. Take change as it costs 1 Sole to use the bathroom. There are no exceptions. Take a hat and at least one bottle of water. There is a lot of walking to do around the ruins. As soon as the sun comes out it can get hot as there is no protection around the ruins. Buses depart back to Aguas Calientes all day at least every 20 minutes. The site starts getting packed with tourists around 10 am. There can be up to 5000 visitors per day at the site. If getting the ultimate photos of Machu Picchu is important, we recommend visiting Machu Picchu for two mornings. In the mountains, there is a big chance of rain and so much cloud and mist over the ruins that it can’t be seen. Even though this adds mystery it is not good for great photos! There are restrictions for professional photographers at Machu Picchu. If you have too much camera equipment they can check your pack and charge more for entry. Officially, packs bigger than 20 litres, lenses bigger than 200mm, and large tripods are not allowed. This is generally not enforced but it is best to be as minimalistic as possible. 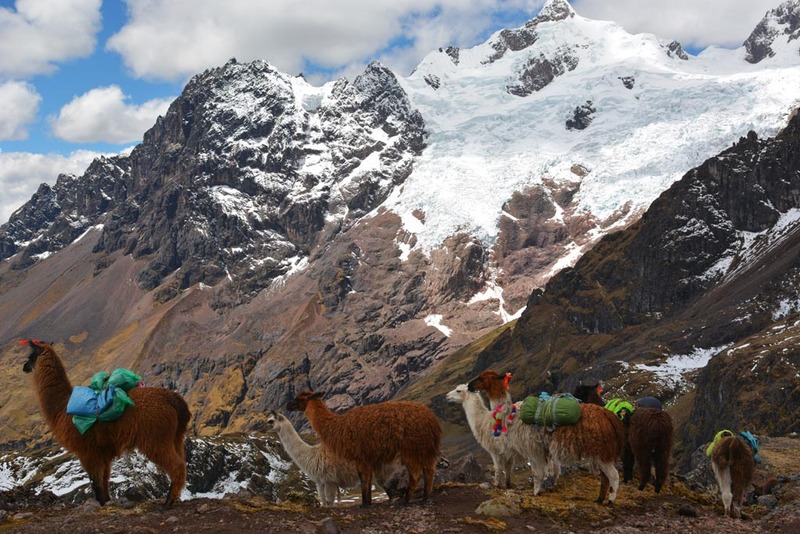 The best months for trekking in Peru are June to September, the days are usually beautiful and sunny, the nights chilly, and freezing in the highlands. In the mountains, there can be snow and the scenery of snow-capped peaks and snowy passes is spectacular. The best chance of snow is during July and August. Though this makes for some spectacular scenery, it can also make some of the trails impassable at times. Temperature ranges from 10°C to 20°C during the day and can drop down to -5°C at night so it is essential to be prepared for the cold! At the briefing the night before the trek, Alpaca Expeditions give trekkers a duffel bag each, to pack everything for the trek. This includes clothes, toiletries and any books or gifts for the school children and villages. This can be up to 7kg per bag and is carried by the team. 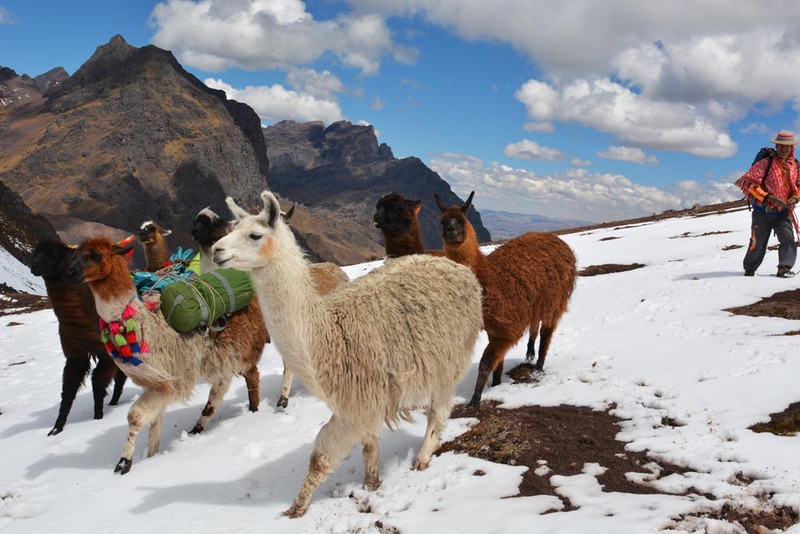 The rest of your luggage not needed on the trek can be left with Alpaca Expeditions. Llamas are not standard on the treks and need to be hired as an extra. 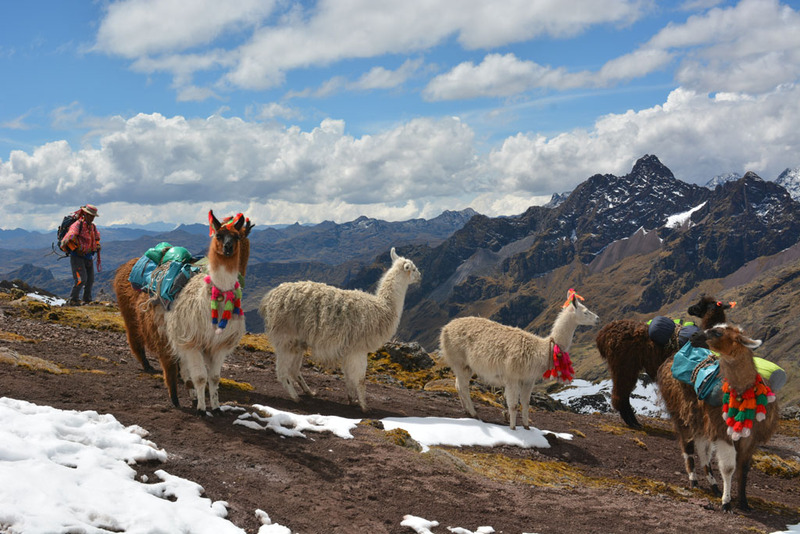 We paid $200 for llamas and llamero for the four-day trek. This is worth every cent as it adds to the experience and they make a cute addition to the trek! Though trekkers can take their own sleeping bags, we hired ours through Alpaca Expeditions for $20 each and inflatable sleeping pads for $15 each. The sleeping pads are worth their weight in gold especially that first freezing cold night! Trekking poles are also available for hire for $15 a pair. I haven’t used these for trekking before, but as the trek involves so much up and downhill I tried them and loved them. I found one easier to use rather than a pair. 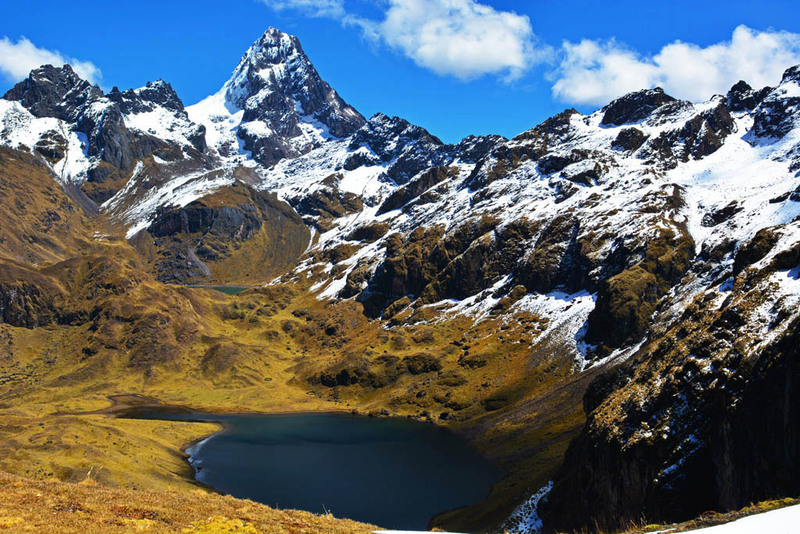 The views are stunning on Lares trek. Thermals (long pants and a long-sleeved top) I lived in my thermals and never took them off! Gloves and beanie are essential. It was so cold on our first night that even snuggled up in my sleeping bag I slept with both gloves and beanie on! Hats – even though it’s cold the sun is still very strong during the middle of the day. A litre aluminium water bottle each which was filled by the team at meal times after boiling the water. These are better for the environment too, rather than the plastic bottles. Backpacks with our water, cameras and anything else we wanted access to during the day, such as lip balm, sunscreen and hats. We set our own pace on the trek. Keep hydrated and drink plenty of liquids. Dehydration decreases the body’s’ ability to acclimatise to the high altitude, so dehydration can be confused with altitude sickness. Spending a couple of days in Cusco before our trek helped us to acclimatise and adjust to the altitude on the trek. Reducing or avoiding alcohol before the trek also reduces the risk of dehydration and helps to cope with high altitude. We never drank alcohol for the two days before the trek. Lots of water, fresh juices and coca tea helped us cope with the altitude. Pace yourself. One of the great benefits of a private trek is going at our own pace. We hired two porters to carry our camera backpacks. 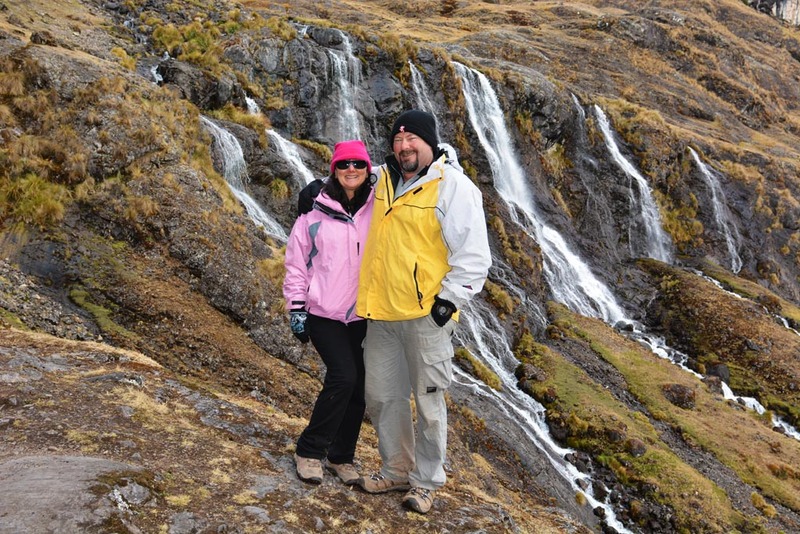 The focus was solely on the trek and the spectacular scenery. 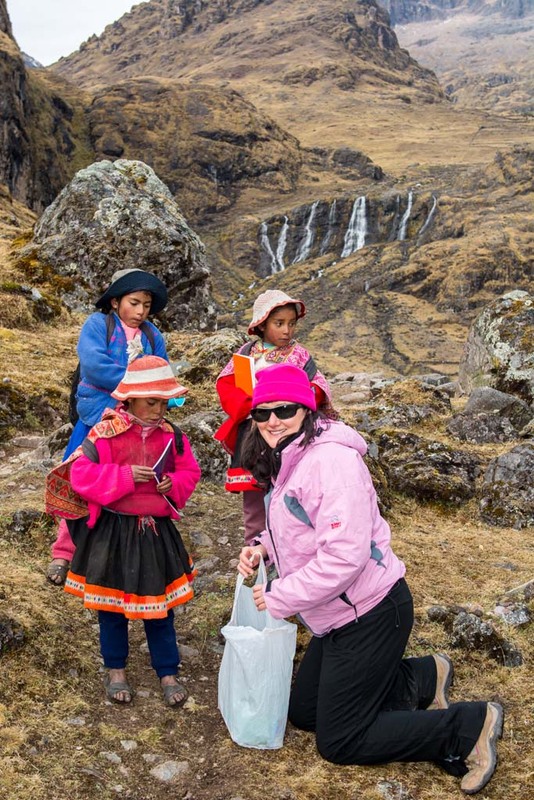 Both of us are very keen to employ locals and our two porters came from the villages on the Lares trek. Our trek was private with Alpaca Expeditions. They are a local company who commit to sustainable tourism. 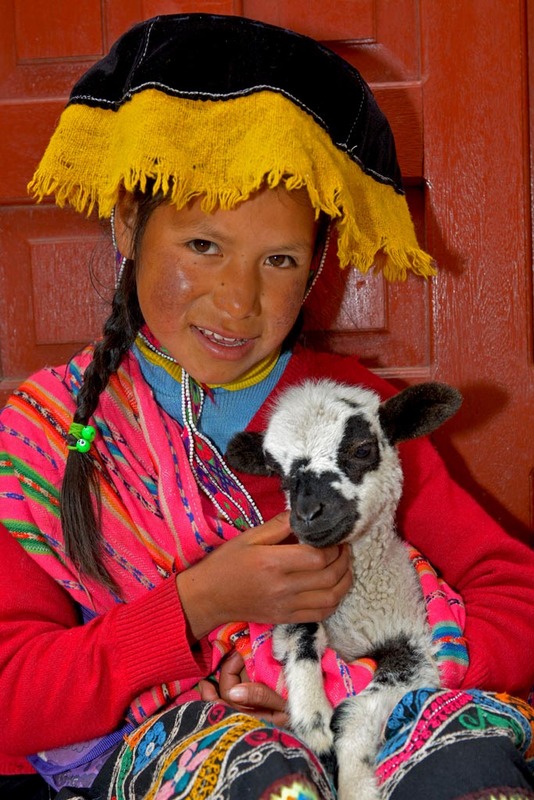 They have many social projects in Peru that improve the living conditions of the locals and children who live in the villages on the treks. There are a lot of advantages of a private trek. With only the two of us, we could set the pace and take breaks when necessary. There was no need to worry if we were holding the group back. Meals and mealtimes were catered especially for us. Being keen photographers, the Alpaca team went out of their way to accommodate us, and would often foresee what we wanted. This would be more difficult with a larger group. There was a rapport with our team and firm friendships formed. The llamas on the trek were a highlight for us. Iquitos is an interesting city with lots of activities and day tours. If doing a cruise or staying at a lodge, it is worth staying an extra couple of days in Iquitos. The jungle also has only two seasons – dry and wet. They are also known as the low and high water season. June to December is the dry and December to April is the wet. The average temperature all year is about 31°C max and 21°C min. The humidity averages 63% to 99%. High season is the same as the rest of Peru, May to October. There are different opinions what the best season is for viewing wildlife, some say the dry season is best as wildlife congregates to the smaller areas of water; while in the wet season boats can get closer to the forest canopies and many plants and trees drop their fruit which attracts monkeys and other rainforest animals. Tuk-tuk drivers in Iquitos wait outside hotels, offering tours and transports to the tourist attractions around Iquitos. They have standard colourful brochures to show would-be customers. Most of these involve a tuk-tuk drive to the harbour and then a water taxi boat, and then another tuk-tuk. They will arrange the whole tour and their prices (after a little bartering) were no more expensive than if we arranged it ourselves. Light long pants, long-sleeved shirt and boots are essential for walks in the jungle. Though it is steaming hot and all we felt like walking in is shorts and shirt, there is a lot of stinging and thorny plants. After the jungle walks and while relaxing in the lodges, shorts, light shirts or singlets and thongs are all that is needed. Even though we didn’t come across any mosquitos, flies or insects, they can be in abundance at times, so take insect repellent just in case. 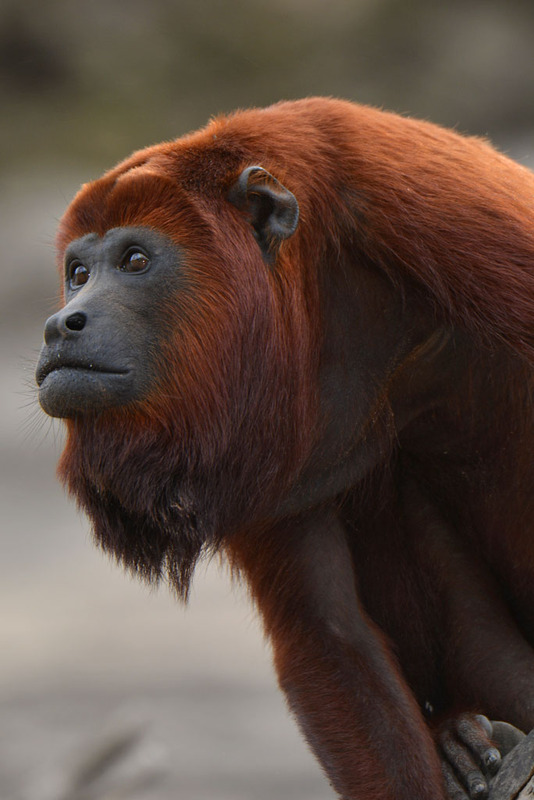 Don’t have too high expectations of seeing wildlife in the Amazon. Though it has an ecosystem unrivalled anywhere else, it is very hard to see the wildlife. 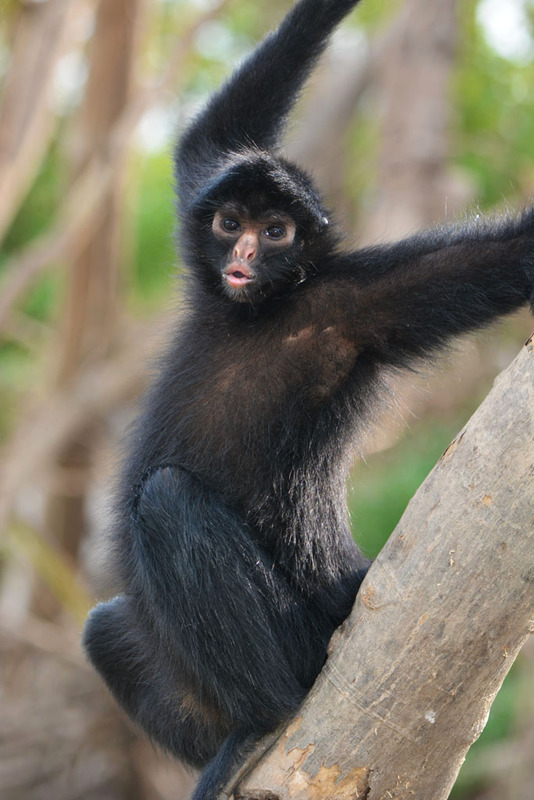 Unless humanised it is very rare to get close to monkeys, sloths and other animals. They are very shy and elusive. Bird watchers have much more luck with so many bird species, especially on the Yarapa River. It is a dream destination for bird watchers. On a big cruise ship, it is unlikely that much wildlife will be viewed up close unless they visit somewhere the wildlife is humanised. Unless humanised it is very rare to get close to the wildlife. So from what I gather Iquitos is the city to experience the jungles. Ollantaytambo is where we need to head to, to get to Machu Picchu and Cusco is our destination to experience the mountains and a trek. Would you suggest how many days we should plan for each of the 3 cities / adventures and the approximate budget that would allow us to enjoy Peru in early August? Also, if we’re a group of 5-7 girls is it safe for women to travel alone? And do we get better rates as a group anywhere? Thanks for the info up ahead! It’s great to have a reliable source who has first-hand experience instead of having to hear it from travel agents who are all hearsay! Hi Pooja. It’s another world away from India for sure! Cusco is generally the first city to start from as it’s the perfect place to acclimatise to the high altitude before a trek. So if you are doing a trek, 2 – 3 nights in Cusco is the perfect amount of time before. After our trek, we transferred to Ollantaytambo and caught the train to Aguas Calientes (Machu Picchu). Aguas Calientes 2 nights and Ollantaytambo 2 nights. If this all you are doing in Peru 14 days is plenty to also include a trek. For 14 days, our budget was about US$100 each per day. This was staying at high-quality hotels and doing a private trek with the two of us only. This price can be reduced a lot more if you stay at less expensive hotels. 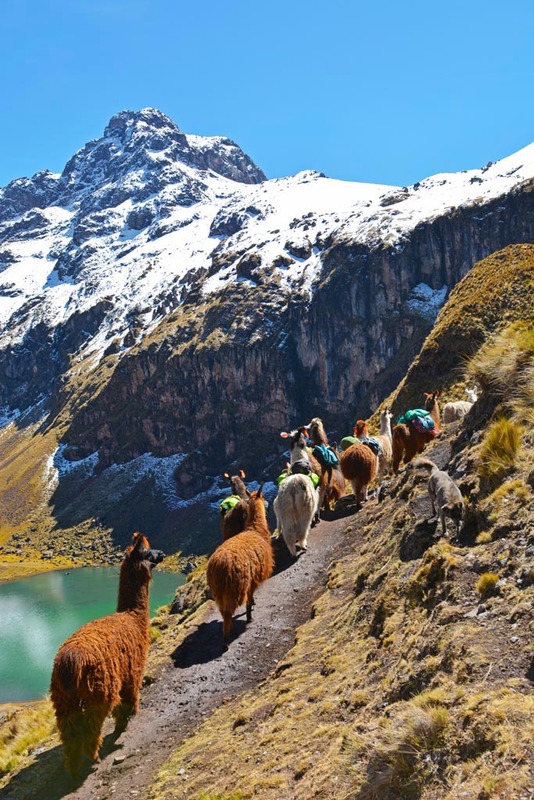 A private trek with Alpaca Expeditions would reduce per person if there is a group of 5-7 of you. And yes it is very safe! Apart from the usual common sense that you use wherever you are, it is one of the safest places you could travel to. Lima the capital, can be an exception if walking alone at night in some unsafe areas (like most large cities). Any more questions don’t hesitate to ask! Great and useful information. Thanks for your sharing . Photos are excellent. Love your crisp and refreshing pictures. Thanks for sharing your travel experience. Just came across your Peru blog. I am going to some of the same places for 14 days with my family. Would love to know the camera and lenses you used for your trip. I am going to rent some lenses for this trip. Thanks in advance. Hi Prerna. Thanks for your comments. You picked some of the best places to visit in Peru! For the majority of our trip including Lares trek, Cusco and Machu Picchu we used our Nikon 24-70 lens. For some of the overall shots at Machu Picchu, we used our Nikon wide angle 14-24. For the jungle our 80-400 lens. If you are not going to the jungle there really is no point in a big lens. I have a Nikon D7100 and Ray has a D800. Hope this helps. Thanks a lot for replying. Do you shoot the D800 with a tripod most of the time? Prerna we use the tripod whenever practical. On the trek it wasn’t always convenient. For example the Llamas move quickly so those shots were handheld but some of the scene shots were with a tripod. None of our people shots are taken with a tripod. Any more questions, don’t hesitate to ask! Hello, excellent information, I would like to add a trip to the list, it is a tourist destination that is in the city of Cusco, it is the Rainbow Mountain or called Vinicunca, if you still do not know it invite you to discover it, Greetings.